As someone who grew up a few hours from New Orleans (yes, in Texas we don’t consider a 6 hour drive very far! 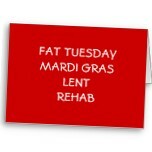 ), and someone who went to Catholic school, I can’t ignore the holiday today – Happy Fat Tuesday everyone! I saw that card online today and thought it was appropriate :). Many people choose to indulge on Fat Tuesday, so I wanted to both give a recipe that allows you to indulge in something at least somewhat healthy given today’s holiday, and give everyone a simple tip that will make giving up unhealthy foods easier! When you go to the grocery store, try to buy most of your groceries from the periphery of the store. Why? Well, pretty much every grocery store is set up the same way. Healthier, whole foods are located on the edges of the store, while processed unhealthy foods (think twinkies, potato chips, and frozen dinners) are located in the central aisles. The big food companies are pretty smart and have set up grocery stores so that you are more inclined to buy unhealthy processed food vs. using fresh vegetables to make your own delicious meals. 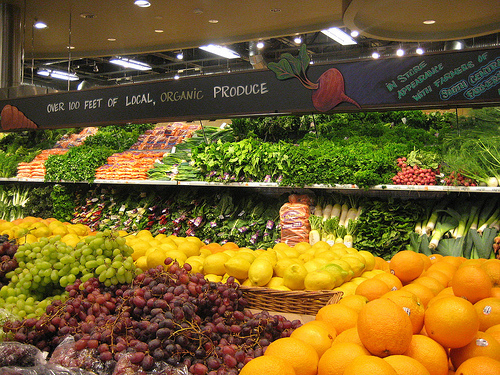 And no, this tip is not foolproof and there are definitely things you’ll have to venture into the aisles to buy, but trying to buy the bulk of your groceries from say, the produce section, will encourage you to a) eat more fruits and veggies and b) make your own food instead of buying processed junk! Now onto the tasty part- Quiche! 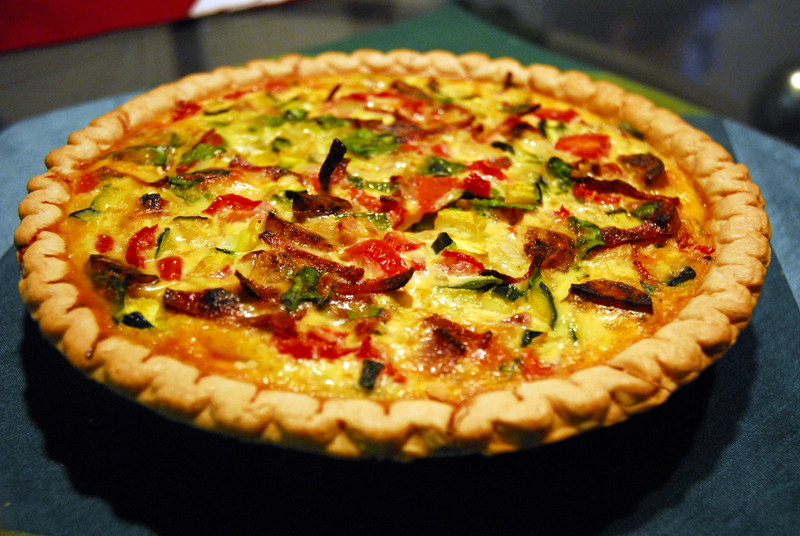 My favorite quiche has always been Quiche Lorraine, even though I strongly dislike swiss cheese. I had a tasty veggie quiche the other day and decided that I wanted to try to “revamp” the classic Quiche Lorraine and make it healthier by adding lots of veggies and making a few substitutions. It turned out scrumptious! Quiche is great because the leftovers make a great breakfast, lunch, or dinner and you can freeze it too. It’s also fairly simple to put together, you just have to bake it a while :). So, in celebration of Fat Tuesday, indulge in a French inspired meal that incorporates lots of veggies but still allows you your cheese and bacon! 2) On an oiled pan, cook your turkey bacon according to package instructions (usually medium high heat for a few minutes each side). 3) On another oiled pan, cook your chicken sausage for a couple minutes on each side over medium heat. 4) Dice your yellow onion, and cook it with a tsp of canola oil over medium heat for 5 minutes. 5) Dice your zucchini and add it to the pan with the onion, cook for another 5 minutes. 6) When the zucchini and onion are almost done, add your spinach to the pan for the last minute. 7) While veggies and meats are cooking, mix together eggs, milk, cheese, salt, sugar, and cayenne in a large bowl. 8) Shred bacon and chop sausage into small pieces. 9) Add bacon and sausage, along with your cooked veggies and quartered grape tomatoes, to the wet ingredients and mix together. 10) Add mixture to the pie crust. You will likely have mixture left over (depending on the depth of your pie crust). Use the leftover mixture to make an omelet or mini crustless quiche – whatever floats your boat! 11) Bake the quiche for 15 minutes at 425, then reduce heat and cook for an additional 45 minutes at 300, or until a knife comes out clean. *Check it after the first 45 minutes, it may need more or less time overall. 12) Let cool for at least 5 minutes, slice, and indulge! 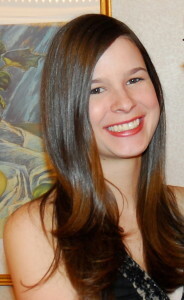 This entry was posted in Recipes and tagged dinner, healthy, pie, quiche. Bookmark the permalink. That looks really really good! I had never heard of it before, but now I want it like…now. Thanks, Tina! It’s so good – give it a try when you have time to bake it one night!